Roger G. Anderson was born circa 1929 at South Dakota. He was the son of Alvin Joel Anderson and Abbie Oliva Lykken. Roger G. Anderson died on 5 February 2014 Roger G. Anderson, 84, of Sioux City, passed away Wednesday, February 5, 2014 at a local hospital. Burial will be at Logan Park Cemetery. Roger was born the son of Alvin and Abby (Lykin) Anderson on March 25, 1929 in Beresford, South Dakota. Roger married Gayle Rosemore on November 29, 1950. After his military service, Roger made his home in Riverside. He was self-employed as a handyman for many years. Roger enjoyed tinkering and building things. He liked to work on his rental houses. Roger was a member of VFW Post #1973. Roger is survived by his wife, Gayle of Sioux City; three sons, Marlon (Debra) Anderson, Bryon (Cheryl) Anderson, and Joel (Shele) Anderson all of Sioux City; one brother, Leroy (Cleone) Anderson of Sioux City; six grandchildren, Melissa (Jamie) Recker, Marnee (Nick) Daugherty, Bryon (Chrissy) Anderson, Jacob Anderson, Selina Anderson, and Austin Anderson; and ten great-grandchildren. He was preceded in death by his parents; one son, Steven; one brother, Myron; and one sister, Ladell. [S250] U.S. Federal Census 1930 U.S. Federal Census, by Ancestry.com, ED64-10. Dwelling 31. [S373] U.S. Federal Census 1940 U.S. Federal Census, by Ancestry.com, Year: 1940; Census Place: Emmet, Union, South Dakota; Roll: T627_3869; Page: 3B; Enumeration District: 64-11. Name Variation Lillian Koch was also known as Lilie. Name Variation Lillian Koch was also known as Lilly. Married Name 30 October 1909 As of 30 October 1909,her married name was Beuthien. Married Name 30 October 1909 As of 30 October 1909,her married name was Beuthen. Lillian Koch was born on 5 November 1889 at Detroit, Wayne, Michigan, also reported as Feb 1889. She was the daughter of Henry Koch Sr. and Bertha Butler. Lillian Koch married Bernhard Beuthien, son of Johann Friedrich Beuthen and Marie Pentner, on 30 October 1909 at his 3rd marriage, her 1st marriage, Oakland, Michigan. Lillian Koch died on 29 December 1918 at Detroit, Wayne, Michigan, at age 29. [S245] U.S. Federal Census 1900 U.S. Federal Census, by Ancestry.com, Year: 1900; Census Place: Detroit Ward 11, Wayne, Michigan; Roll: 751; Page: 2B; Enumeration District: 0124; FHL microfilm: 1240751. [S244] U.S. Federal Census 1910 U.S. Federal Census, by Ancestry.com, ED155. Stamp 262. Name Variation Bernhard Beuthien was also known as Barney. Name Variation Bernhard Beuthien was also known as Beuthen. Name Variation Bernhard Beuthien was also known as Barny. Name Variation Bernhard Beuthien was also known as Barnhard. Bernhard Beuthien was born on 27 July 1875 at Germany also reported as 27 Mar 1875. He was the son of Johann Friedrich Beuthen and Marie Pentner. Bernhard Beuthien married Ann B. Lortz on 1 June 1901 at his first marriage, Pontiac, Oakland, Michigan. Bernhard Beuthien married Elizabeth Ihlenfeld on 11 April 1907 at 2nd marriage for him, Detroit, Wayne, Michigan. Bernhard Beuthien married Lillian Koch, daughter of Henry Koch Sr. and Bertha Butler, on 30 October 1909 at his 3rd marriage, her 1st marriage, Oakland, Michigan. Bernhard Beuthien married Jessie A. Brown on 26 November 1923 at Holly, Oakland, Michigan. Bernhard Beuthien died on 30 January 1944 at Oakland, Michigan, at age 68 From the Holly, Michigan Newspaper dated 3 Feb 1944: Bernhard Beuthein, 68, was found dead in bed at his home, 415 Harding St., at 8am Sunday morning by Fred Haller who lived with him. He was born in Germany on July 27, 1875. Surviving are his son, Fred and a daughter, Mrs. Albert Schrank of Keego Harbor. Bernhard Beuthien immigrated with Johann Friedrich Beuthen and Marie Pentner in 1884. Bernhard Beuthien was confirmed on 25 March 1888 at St Paul Lutheran Church, Grosse Pointe Farms, Michigan. [S245] U.S. Federal Census 1900 U.S. Federal Census, by Ancestry.com, ED110. Dwelling 9. [S250] U.S. Federal Census 1930 U.S. Federal Census, by Ancestry.com, ED63-29. Dwelling 554. [S373] U.S. Federal Census 1940 U.S. Federal Census, by Ancestry.com, Year: 1940; Census Place: Holly, Oakland, Michigan; Roll: T627_1799; Page: 8A; Enumeration District: 63-49. Name Variation James E. Boyd was also known as James C.
James E. Boyd was buried at Golconda, Pope, Illinois. He was born circa 1850 at Kentucky. He married Ella (?) circa 1875. [S250] U.S. Federal Census 1930 U.S. Federal Census, by Ancestry.com, ED73-19. Dwelling 374. Married Name circa 1875 As of circa 1875,her married name was Boyd. Ella (?) was born circa 1855 at Kentucky. She married James E. Boyd circa 1875. Nate Stansberry was born on 23 April 1883 at Texas. He married Marietta Combs, daughter of Jacob Gentry Combs and Margaret Elizabeth Crotchett, after 1940. Nate Stansberry died on 25 February 1973 at Humboldt, California, at age 89. He was buried after 25 February 1973 at Ocean View Cemetery, Eureka, Humboldt, California. Nate Stansberry lived in 1942 at Briceland, Humboldt, California. Name Variation Doralf Alvin Evjen was also known as Dorols. Doralf Alvin Evjen was born on 16 September 1900 at South Dakota. He was the son of Carl Olson Evjen and Helmine J. Christopherson. [S184] Beresford Republic Newspaper, Dec 15. [S244] U.S. Federal Census 1910 U.S. Federal Census, by Ancestry.com, ED431. Dwelling 20. [S243] U.S. Federal Census 1920 U.S. Federal Census, by Ancestry.com, ED250. Dwelling 39. [S250] U.S. Federal Census 1930 U.S. Federal Census, by Ancestry.com, ED64-10. Dwelling 133. Name Variation Samuel Huntley was also known as Sam. Samuel Huntley was born in September 1876 at Wisconsin. He was the son of Walter A. Huntley and Laura J. Dyke. Samuel Huntley married Gertrude Nickey, daughter of Silas F. Nickey and Frances A. Sherwood, circa 1905. Samuel Huntley died in 1941. [S180] Wisconsin Sauk Co Cemetery Records Vol 6, page 77. [S246] U.S. Federal Census 1880 U.S. Federal Census, by Ancestry.com, NA Film Number T9-1446 Page Number 229A. [S245] U.S. Federal Census 1900 U.S. Federal Census, by Ancestry.com, ED145. Dwelling 2. [S244] U.S. Federal Census 1910 U.S. Federal Census, by Ancestry.com, Year: 1910; Census Place: Reedsburg, Sauk, Wisconsin; Roll: T624_1737; Page: 10A; Enumeration District: 0125; Image: 24; FHL Number: 1375750. [S243] U.S. Federal Census 1920 U.S. Federal Census, by Ancestry.com, Year: 1920;Census Place: Ontario, San Bernardino, California; Roll: T625_129; Page: 12A; Enumeration District: 165; Image: 163. [S250] U.S. Federal Census 1930 U.S. Federal Census, by Ancestry.com, ED56-34. Dwelling 64. [S373] U.S. Federal Census 1940 U.S. Federal Census, by Ancestry.com, Year: 1940; Census Place: Wood River, Burnett, Wisconsin; Roll: T627_4462; Page: 5B; Enumeration District: 7-24. Robert Sherwood Huntley was born on 26 April 1909 at Reedsburg, Sauk, Wisconsin. He was the son of Samuel Huntley and Gertrude Nickey. Robert Sherwood Huntley married Wilma A. Jackson, daughter of Albert Jackson and Matilda Mortimer, on 25 January 1930 at Dubuque, Iowa. Robert Sherwood Huntley died in March 1986 at age 76. Robert Sherwood Huntley obtained US Social Security Card at Wisconsin; last residence Grantsburg, Burnett, Wisconsin. [S373] U.S. Federal Census 1940 U.S. Federal Census, by Ancestry.com, Year: 1940; Census Place: Wood River, Burnett, Wisconsin; Roll: T627_4462; Page: 2B; Enumeration District: 7-24. Samuel D. Huntley was born on 16 May 1913 at Wisconsin. As of 1940, Samuel D. Huntley was never married. He died in March 1978 at age 64. Samuel D. Huntley obtained US Social Security Card at Wisconsin; last residence Grantsburg, Burnett, Wisconsin. Married Name 2 April 1871 As of 2 April 1871,her married name was Teel. Sarah Elma McCormick was born on 3 September 1852 at Hinsdale, Lee, Iowa. She married David Wilson Teel Jr. on 2 April 1871 at St. Francisville, Clark, Missouri. Sarah Elma McCormick died on 21 January 1945 at Garberville, Humbolt, California, at age 92. Children of Sarah Elma McCormick and David Wilson Teel Jr.
Arthur Abe Olds was born on 19 November 1898 at Lake Village, Newton, Indiana. He was the son of Abe Olds and Mary Catherine Fedde. Arthur Abe Olds married Hazel Isenhart circa 1918. Arthur Abe Olds and Hazel Isenhart were divorced before 1940. Arthur Abe Olds married Pearl M. (?) in 1940. Arthur Abe Olds died on 4 December 1973 at Indiana at age 75. He was buried after 4 December 1973 at Graceland Memorial Park, Valparaiso, Porter, Indiana. [S250] U.S. Federal Census 1930 U.S. Federal Census, by Ancestry.com, ED46-42. Dwelling 97. Married Name circa 1919 As of circa 1919,her married name was Olds. Married Name after 1930 As of after 1930,her married name was Wesner. Hazel Isenhart was born circa 1900 at Indiana. She married Arthur Abe Olds, son of Abe Olds and Mary Catherine Fedde, circa 1918. Hazel Isenhart married Andrew Wesner after 1930. Hazel Isenhart and Arthur Abe Olds were divorced before 1940. Hazel Isenhart died after 1995. [S204] California Death Records (published), for Edward Olds. Married Name Her married name was Bauer. Katherine Olds married (?) Bauer. Katherine Olds was born circa 1919 at Indiana. She was the daughter of Arthur Abe Olds and Hazel Isenhart. Katherine Olds died before 1995. Edward Paul Olds was born on 12 July 1920 at Indiana. He was the son of Arthur Abe Olds and Hazel Isenhart. Edward Paul Olds went into the Navy when he was young fought in WW II . He was an insurance adjuster for State Farm and Allstate for many years and after my parents divorced he went into auto body work. Edward Paul Olds obtained US Social Security Card; long-time retired railroad worker. last residence Norwalk, Los Angeles, California. Shirley Violet Olds was born on 23 November 1923 at Westville, La Porte, Indiana. Age 71 of Portage, passed away Sat. Nov. 11, 1995. Born Nov. 21, 1923 in East Chicago. She was a homemaker living in the Portage are most of her life. Survivors: mother, Hazel (Andrew) WESNER of LaPorte; 2 sons, Charles (Annette) HOECKELBERG of Portage, Thad (Patricia) BRASHER of Cedar Lake; 3 daughters, Georgette GONZALES of Highland, Regina HOECKELBERG of Oklahoma, Lynnette BRASHER of Kentucky; 1 brother, Bob (Miriam) OLDS of Florida; 2 sisters, Evelyn (Paul) MAGLEY of LaPorte, Virginia MILLER of Michigan; 17 grandchildren; several great grandchildren. Preceded in death by her father, Arthur OLDS; daughter, Elizabeth HOECKELBERG, brother, Edward OLDS; 3 sisters, Katherine BAUER, Mary Louise OLDS, Phyllis WEBB. She was buried after 11 November 1995 at Calvary Cemetery, Portage, Porter, Indiana. Name Variation Robert Olds was also known as Bob. Robert Olds married Miriam (?). Robert Olds was born circa 1925 at Indiana. Mary Louise Olds was born circa 1927 at Indiana. Mary Louise Olds died before 1995. Name Variation Irene Gertrude Schlosser was also known as Irene E.
Married Name 26 December 1926 As of 26 December 1926,her married name was Hahn. Irene Gertrude Schlosser was born on 19 April 1887 at Wisconsin. She was the daughter of Anton Schlosser and Rosina Charlotte Diehl. Irene Gertrude Schlosser married Theodore Edward Hahn, son of Theodore H. Hahn and Hannah (? ), on 26 December 1926. Irene Gertrude Schlosser died on 11 April 1959 at age 71. 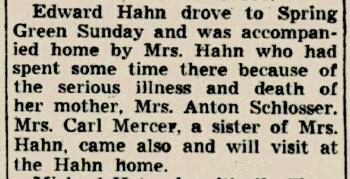 In May 1938 Edward Hahn drove to Spring Green and was accompanied home my Mrs Hahn (Irene Schlosser) who had spent some time there because of the serious illness and death of her mother, Mrs Anton Schlosser (Rosina Diehl). 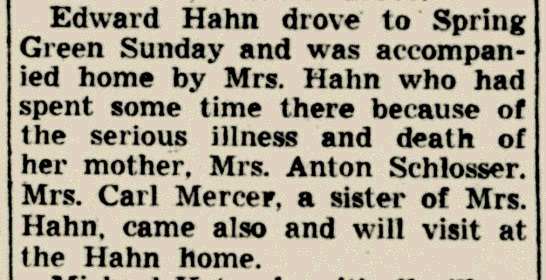 Mrs Carl Mercer (Pearl Schlosser), a sister of Mrs Hahn, came also and will visit at the Hahn home. Morrilton, Genealogy Crotchett --- Tanner, Page 135. [S180] Wisconsin Sauk Co Cemetery Records Vol 6, Pg. 110. [S364] Wisconsin State Census Wisconsin State Censuses, 1895 and 1905, by Ancestry.com, Dwelling 284. [S244] U.S. Federal Census 1910 U.S. Federal Census, by Ancestry.com, ED126. Dwelling 160. [S243] U.S. Federal Census 1920 U.S. Federal Census, by Ancestry.com, ED178. Dwelling 135. [S250] U.S. Federal Census 1930 U.S. Federal Census, by Ancestry.com, Year: 1930; Census Place: Lake Mills, Jefferson, Wisconsin; Roll: 2576; Page: 11B; Enumeration District: 22; Image: 399.0. James H. Kessenich was born on 20 October 1898 at Wisconsin also reported as 2 Oct 1898. He was the son of Peter Kessenich Jr. and Mary Ann McCarville. [S255] Wisconsin Richland County Death Index, by Wisconsin, 18b-042. [S245] U.S. Federal Census 1900 U.S. Federal Census, by Ancestry.com, ED129. Dwelling 143. [S244] U.S. Federal Census 1910 U.S. Federal Census, by Ancestry.com, ED110. Dwelling 113. [S243] U.S. Federal Census 1920 U.S. Federal Census, by Ancestry.com, ED195. Dwelling 309. [S250] U.S. Federal Census 1930 U.S. Federal Census, by Ancestry.com, ED52-3. Dwelling 203. [S373] U.S. Federal Census 1940 U.S. Federal Census, by Ancestry.com, Year: 1940; Census Place: Buena Vista, Richland, Wisconsin; Roll: T627_4518; Page: 13A; Enumeration District: 52-3. Frank L. Kessenich married Helen C. Kenny. Frank L. Kessenich was born on 31 March 1900 at Wisconsin. Frank L. Kessenich died in 1958. [S180] Wisconsin Sauk Co Cemetery Records Vol 6, page 131. Married Name 23 October 1954 As of 23 October 1954,her married name was Johanning. Clara Mary Kessenich was born on 20 October 1903 at Wisconsin. She was the daughter of Peter Kessenich Jr. and Mary Ann McCarville. Clara Mary Kessenich married Leo Peter Johanning on 23 October 1954. Clara Mary Kessenich died on 21 May 1988 at age 84. Clara Mary Kessenich obtained US Social Security Card at Wisconsin; last residence Highland, Iowa, Wisconsin. [S250] U.S. Federal Census 1930 U.S. Federal Census, by Ancestry.com, ED52-3. Dwelling 202. John Kessenich was born on 13 March 1905 at Wisconsin. John Kessenich died in May 1987 at Wisconsin at age 82. John Kessenich obtained US Social Security Card at Wisconsin; last residence Lone Rock, Richland, Wisconsin. Married Name after April 1930 As of after April 1930,her married name was Limmex. Marie Anna Kessenich was born on 23 April 1907 at Wisconsin. Marie Anna Kessenich married Jerome James Limmex, son of James L. Limmex and Mary Ann Flynn, after April 1930. Marie Anna Kessenich obtained US Social Security Card at Wisconsin; last residence Spring Green, Sauk, Wisconsin. [S190] The Richland Observer, 1995-12-14. [S180] Wisconsin Sauk Co Cemetery Records Vol 6, page 120. Peter James Kessenich was born on 13 December 1894 at Bear Valley, Richland, Wisconsin. Peter James Kessenich married Marie A. Bauer, daughter of John Wolfgang Bauer and Matilda Dischler, on 12 February 1924. Peter James Kessenich died on 15 March 1971 at Wisconsin at age 76. Peter James Kessenich obtained US Social Security Card at Wisconsin; last residence Plain, Sauk, Wisconsin. [S250] U.S. Federal Census 1930 U.S. Federal Census, by Ancestry.com, ED56-8. Dwelling 120. Married Name 12 February 1924 As of 12 February 1924,her married name was Kessenich. Marie A. Bauer was born on 27 October 1902 at Wisconsin. She was the daughter of John Wolfgang Bauer and Matilda Dischler. Marie A. Bauer married Peter James Kessenich, son of Peter Kessenich Jr. and Mary Ann McCarville, on 12 February 1924. Marie A. Bauer obtained US Social Security Card at Wisconsin; last residence Jefferson, Jefferson, Wisconsin. [S190] The Richland Observer, 1997-10-23. Married Name Her married name was Kessenich. Helen C. Kenny married Frank L. Kessenich, son of Peter Kessenich Jr. and Mary Ann McCarville. Helen C. Kenny was born on 1 July 1902. Helen C. Kenny obtained US Social Security Card at Wisconsin; last residence Middleton Branch, Dane, Wisconsin. [S190] The Richland Observer, 1993-12-30. Leo Peter Johanning was born on 25 August 1921 at Iowa. He married Clara Mary Kessenich, daughter of Peter Kessenich Jr. and Mary Ann McCarville, on 23 October 1954. Leo Peter Johanning died on 13 August 2005 at Wisconsin at age 83. Jerome James Limmex was born on 7 March 1908 at Wyoming, Iowa, Wisconsin. He was the son of James L. Limmex and Mary Ann Flynn. Jerome James Limmex married Marie Anna Kessenich, daughter of Peter Kessenich Jr. and Mary Ann McCarville, after April 1930. He died in February 1966 at Madison, Dane, Wisconsin, at age 57. Jerome James Limmex obtained US Social Security Card at Wisconsin; last residence not specified.